Just a few days back, I posted a link to these DIY firewood rack brackets that Menards was carrying on their site. I ordered five sets and got busy working with three of them. Here, above, is a work-in-progress show that shows the position of one of the racks that I'm building. This one is the one right outside of the family room door and I've built the rack in a vertical orientation. I ended up using some rough sawn cedar that was left over from my fence installation, but that move caused some issues. Turns out, rough sawn cedar 2x4's aren't the same size as normal, dimensional construction lumber. They're a bit bigger. Not true two inches by four inches, but bigger by just a hair. Here's the height difference. 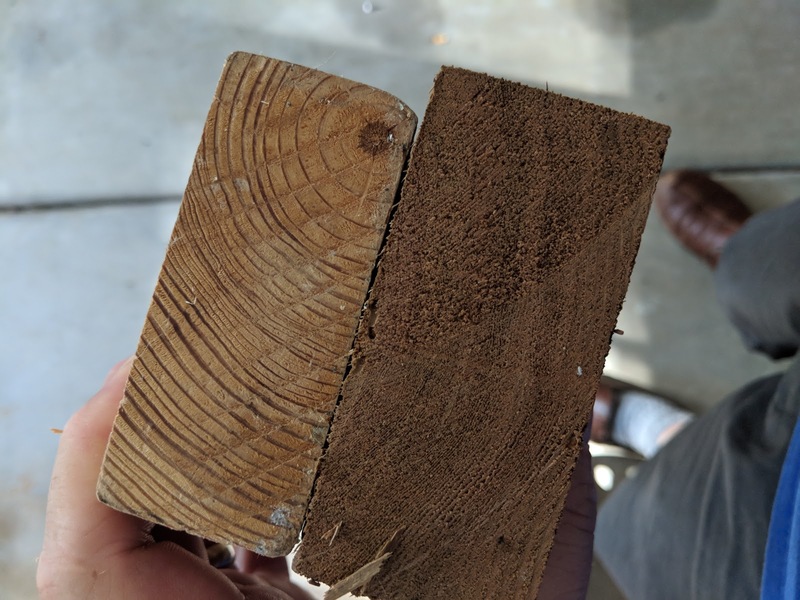 On the left is a traditional, Home Depot bought 2x4. On the right is a rough sawn Cedar 2x4. I first went to Home Depot and the one by us has just an indoor lumber yard, so they have limited supply. 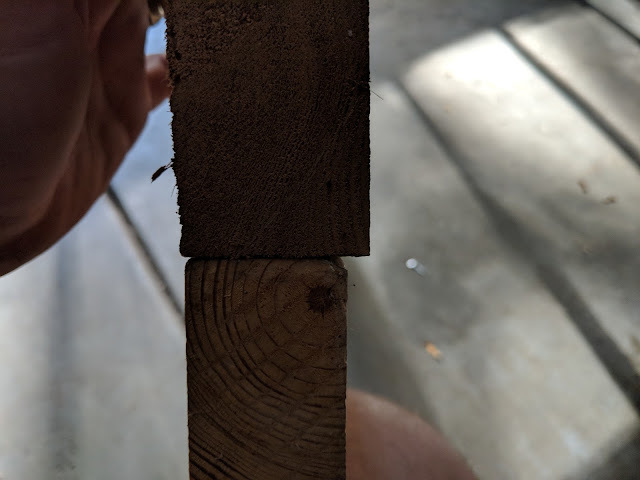 The guy looked at me like I was nuts when I brought in a cut-end of one of the cedar 2x4's. He said: "50 years ago, you could have bought that. Not today." Off I went to Menards. And sure enough, out in the outdoor lumber yard, on the top level, they have 2x4x8 rough sawn cedar boards. The brackets are made for traditional 2x4's. So, they required a bit of force to get in. And you know what everybody's dad's mantra is when it comes to woodworking, right? "Don't force it." At least that's what my Dad use to tell me and it is good advice for just about anything. Don't force it. Guess what? I forced it. And it turned out ok. The plastic brackets are made with a little bit of slop built in and I think that's because of this exact instance. 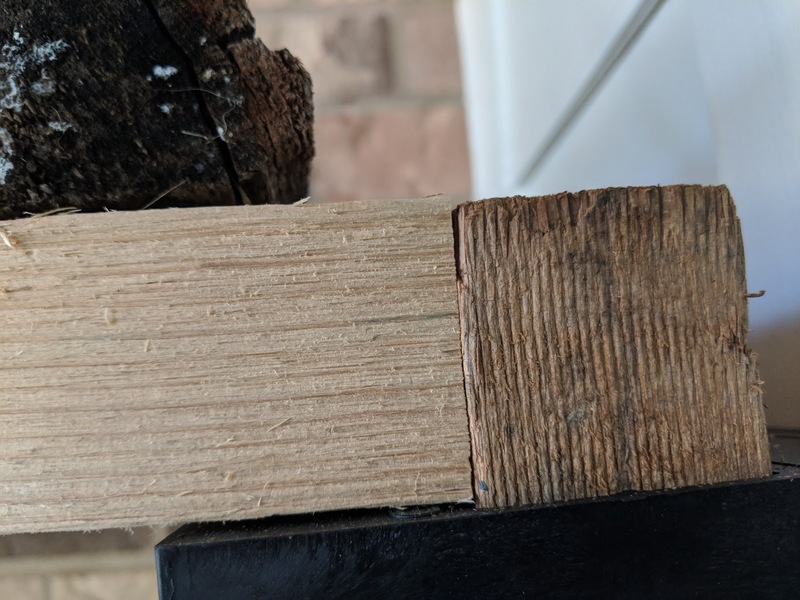 They'll basically allow for rough sawn lumber to work, but they have a solve for conventional dimensional lumber - by overlapping the cross members by 1/16th of an inch. You can see in the photo above that I decided to use three sets of the brackets on this rack. The uprights are eight foot tall and I placed one set (of course) at the floor, one at the top and that meant that the middle installation was the toughest. Besides getting them *on* the uprights, I then had to kind of persuade them down the length of the lumber. Enter the persuader. Or, a rubber mallet. I tap-tap-tapped them down and eventually they got to where I wanted them. They're not quite half way, but I figured I'd like the top 2/3rds to be the most rigid, so I stopped with a 40" gap on the top. And after accounting for the brackets themselves just about 50" gap on the bottom. 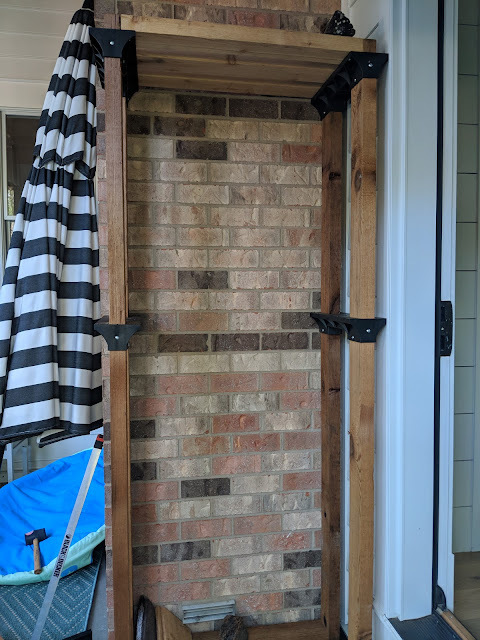 Despite this being rough sawn lumber and just a DIY firewood rack, I wanted things to work properly, so used a level to ensure that the pitch was just a hair tilted backwards towards the wall. Here's proof of the level in use. I figured that the natural momentum/lean of this rack is going to be out to the non-wall side and forward - away from the fireplace. Knowing I was stacking this thing high, a ever-so-slight title back towards the brick seemed to me to be right call. The wood - once stacked - will have the tiniest bit of gravity keeping the rack back against the bricks. I also tried to get nice, clean joints. Here's a look at one of the work-in-progress dry fits. Even with this large, rough sawn lumber, I was able to fit the pieces together nicely. Once I put a screw to the bottom of the bracket, I'll be able to draw out that slight gap at the bottom where the board meets the bracket. Tonight I'm going to get out in the garage and make the final few cuts for the last three cross-members that will go in the middle section, then this rack will be ready for firewood. With September hitting the mid-part of the month, I'm going to have to get the final rack done in to order the wood for delivery next week. Have to hustle.